A contributed paper presented at the New England Estuarine Research Society Spring Meeting, Portland, Maine, May 18-20, 2000. A growing body of evidence suggest that communities of marsh nekton are stratified along a depth gradient partly in response to the influence of tidal and diel changes in physical conditions. In addition, ontogenetic shifts in habitat use along this gradient are key to our understanding of marsh function and the process of trophic relay, yet have rarely been specifically addressed. The goal of this study was to develop sampling methodologies and collect preliminary data to test the hypothesis that nekton faunal assemblages, species densities, and ontogenetic stages of Atlantic silversides and other species, are stratified along a marsh creek-to-bay coenocline (i.e., the marsh gradient). Preliminary results include: 1) successful development and use of a new seine sampling technique that provides density estimates of nekton in marsh creek and shallow bay environments, 2) we obtained sufficient preliminary data (69 seine samples) to compare the effectiveness of this new technique against a more conventional standardized seining method, 3) we obtained preliminary data on the diel and tidal changes in temperature along the marsh gradient, and 4) we obtained preliminary data illustrating strong diel changes in nekton density distributions and faunal assemblages along the marsh gradient. Amazingly, low tide fish densities reached values well over 500 fish sq. m.
*Title and abstract of actual talk modified from that submitted prior to the meeting. Slide 9. See Figure 6 in the interim report. Changes in water temperature over three days at different locations along the gradient. Note strong diel and tidal interactions in temperature cycles. Strong damping of the cycles moving down the gradient. Water temperatures exhibited diel cycles of 10 C in the upper creek, but only a couple degrees in the bay. Slide 10. See Figure 7 in the interim report. Same as Slide 10. Slide 11. Basic catch statistics including top species by density and biomass. Note, maximum densities exceeded 800 animals per square meter! Slide 12. A comparison of densities between experimental (block nets) and control seines. Most species, with the notable exception of Cyprinodon variegatus, were more abundant in the experimental nets. Slide 13. Depletion of catch (mean densities) among repeated seines. Densities of most species were rapidly depleted by the third seine, with the exception of the Gobiidae, which showed little change. Slide 14. Difference between depletion rates between experimental and control seines. Regression analysis indicates that catches would approach zero by the 4th seine in block nets, but not until the 7th or 8th seine in the control seines. Catches of Atlantic menhaden, Brevoortia tyrannus, are shown as an example in the bottom graph. Slide 15. Comparison of catches between day and night samples. 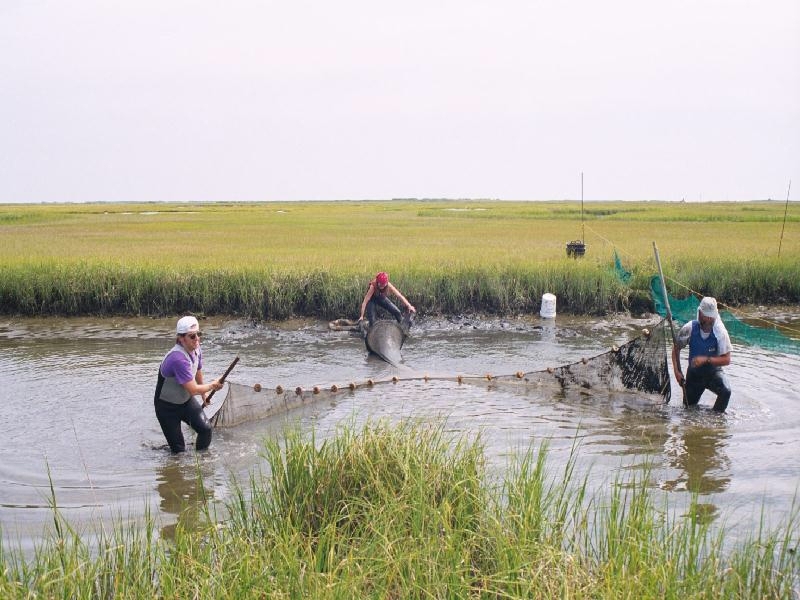 Total catch were twice as high, and Atlantic silversides were 10 times as high at night, while catches of many species traditionally considered marsh residents were typically greater during the day. Slide 16. Most species exhibited strong density differences among strata. Total densities were 20 times greater in the upper creek than in the bay. Slide 17. Despite strongly increasing densities moving up the creek gradient, diversity was greatest in the bay and lowest in the upper creek strata. Slide 18. Canonical discrimination analysis of strata group means showing 95% C.I. of strata canonical means (ellipses). Igenvectors of species with original variates (densities) strongly correlated with canonical axis are shown (Species shown in red are significantly correlated with CAN2, blue with Can1, and green with both axes). Slide 20. Adult weakfish were observed feeding in the creeks at the earliest stages of the flood tide, apparently taking advantage of hugh concentrations of prey with little danger of stranding or exposure to low dissolved oxygen (since they moved in with the flood tide). Weakfish were observed as far up as 400 m above the creek mouth.